When you walk past Misato, a Japanese eatery that recently moved from The Cathay to The Centrepoint, you would think it's another run-of-the-mill mass-market outlet with its open front and rows of square, generic-looking tables. And its menu supports that notion, with colourful photos of dishes that range from okonomiyaki to gyoza to nabe sets - most of them priced at under $20. It is only when the food arrives that you realise this is no ordinary mass-market eatery. The plating is too beautiful and some of the crockery is exquisite. Food-wise, it is also a notch above what you would expect for the price. For example, the Okonomiyaki ($14.90) is made with Japanese yam and cabbage rather than local vegetables. It tastes good and is marred only by too much sauce, which makes it a tad salty. For something with a lighter flavour, try the Seafood Kaminabe Set ($20.80). Tiger prawns, salmon and chicken are cooked at the table with assorted vegetables and beancurd in a clear niboshi broth, resulting in a clean-tasting and wholesome hotpot. The Cha Soba ($13.80, above) is also good if you are seeking clean flavours. The noodles are presented beautifully, with the strands looped into a figure eight. It is a generous serving too - enough for two persons if you order other dishes. The eatery is hard to find, though. It is at the back of the mall in a food-and-beverage enclave called Gastro+. It is hidden behind a pillar and you see it only when you walk past the other eateries. Joyden Canton Kitchen, which opened in HillV2 three years ago, is now called simply Joyden Canton. It also opened a second outlet last month on the fourth floor of Shaw House, accessible through Isetan department store. The menu focuses on homey Cantonese dishes and the new outlet has some exclusive dishes not found in HillV2. Among them is the Pig Tail, Black-eyed Pea And Peanut Soup ($8) that is found more often in home kitchens than in restaurants. It is a robust soup and I especially like the distinctive flavour of dried mandarin peel in it. Another dish I like is the Daliang Pan-Fried Stuffed Lotus Root ($9), with minced pork and chopped shiitake mushrooms and water chestnuts stuffed into the lotus root, which is battered and deep-fried. Other dishes, however, are original takes on Cantonese dishes. An example is the rather odd Twice-Baked Golden Egg Gratin With Caramelised "You Tiao" ($18, above). 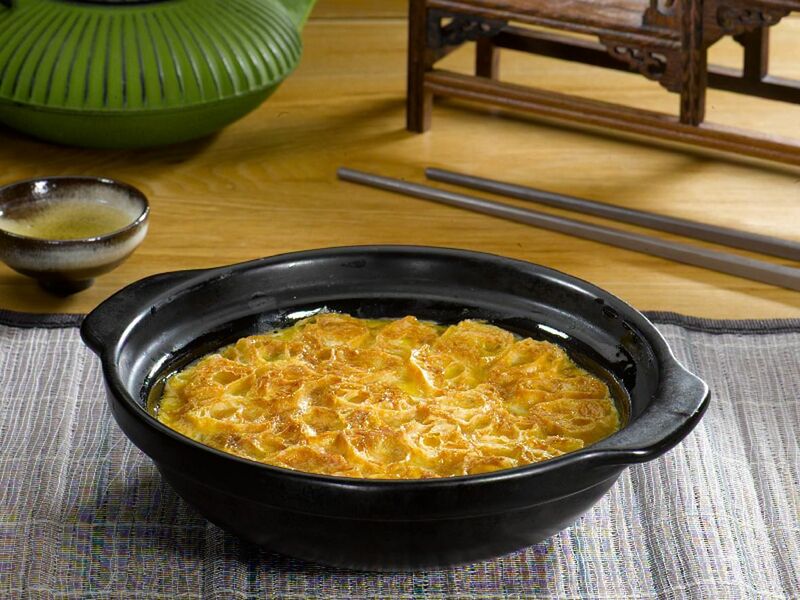 It is inspired by a traditional dish of baked egg with fish intestines, except that the intestines are replaced with jelly fish and vermicelli. The more unusual twist is the top layer of sliced you tiao (dough fritters), which is brushed with honey sauce. The sweetness complicates the flavours and doesn't quite work for me, though. While I am not totally impressed with the food at Luka, a new Italian restaurant in Tanjong Pagar Road, there are a couple of dishes by Japanese chef Takashi Okuno that I would not mind eating again. The Whipped Bottarga Cream & Pretzel ($10) is a good way to start the meal. A nice and chewy pretzel comes with a thick dip that looks like hummus, but with the characteristic salty flavour of cured fish roe. 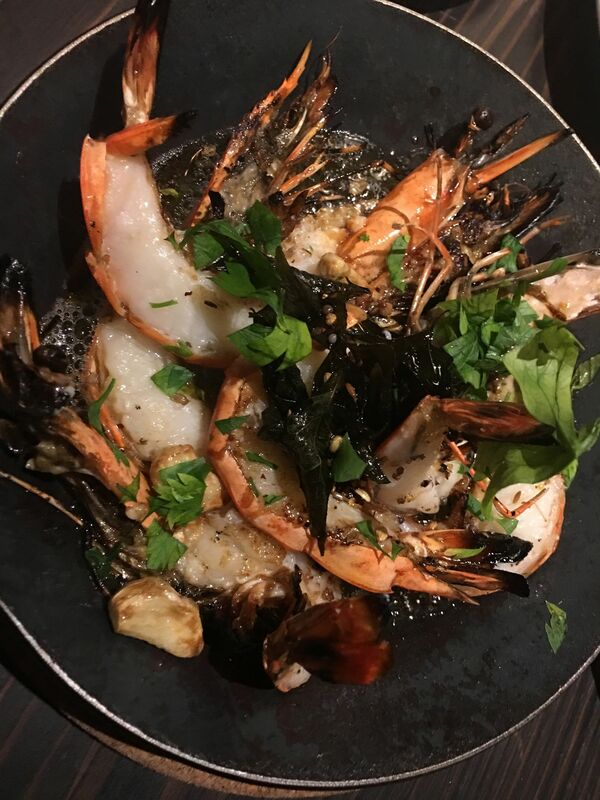 I would also go back for the Gamberi ($15, above), grilled prawns tossed in olive oil with garlic, coriander seeds and curry leaves. The prawns themselves are fresh and sweet, but it is the oil at the bottom of the pan that I find irresistible. It is infused with flavours from the prawn heads and shells. It smells amazing and reminds me of a good prawn stock. Keep some pretzel from the other dish to mop it up. Unfortunately, the rest of my meal fails to impress - from the Smoked Egg, Wagyu, Uni ($10), which sounds more exciting than it tastes, to the equally boring Prosciutto E Rucola Burrata Pizza ($23). Hua Ting Restaurant is offering great deals for five of its popular dishes, which it calls its Fantastic Five. Available for lunch and dinner daily, the promotions include a 50 per cent discount for three of them. Australian Whole Abalone (three-head) Braised With Superior Oyster Sauce is now going for $38 each (down from $76), while Baked Hokkaido Scallop With Bacon & Cream Sauce is now at $9.80 (from $19.60). And Sri Lankan crabs are down to $6 for 100g instead of $12 and you can get them cooked in various ways such as steamed or in chilli gravy. 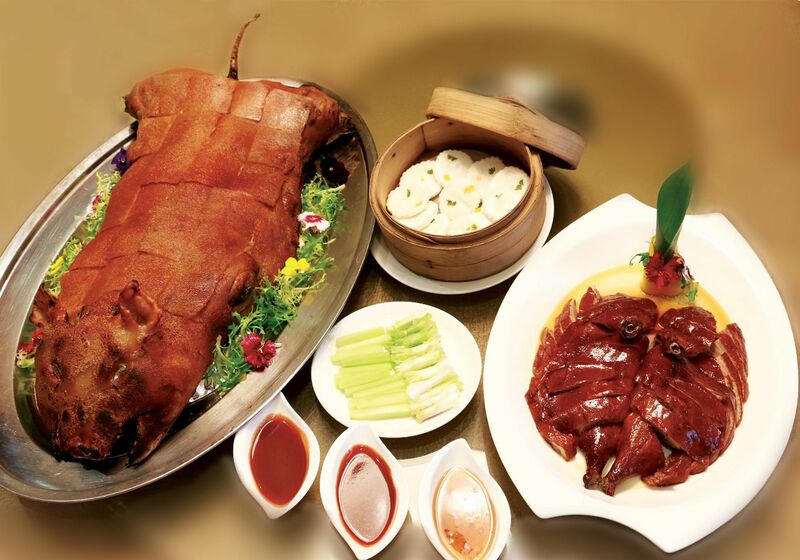 The other two dishes on offer are the Golden Suckling Pig (above left, $168 instead of $248), which requires a table of at least six persons; and the Signature Crispy Roast Duck (above right, $24 for half instead of $45, and $48 for a whole duck instead of $82). The duck is for a minimum of four diners. Hua Ting is known for excellent Cantonese cooking and a tasting of the suckling pig and abalone does not disappoint. With the offer, they are also probably the cheapest you can find in a five-star hotel restaurant. There is no end date for the promotion, but word has it that the restaurant will be closed for renovations in the third quarter of the year, in which case you have a few months to enjoy the deal. Book a meal at Misato or Luka with Chope.